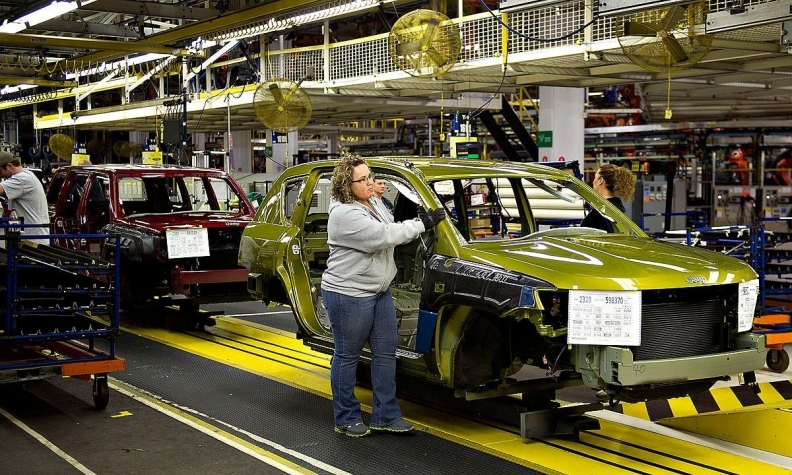 A Jeep Compass on the production line at Fiat Chrysler's assembly plant in Belvidere, Ill., in Feb. 2012. Every month in 2016, approximately CND $233 million in vehicle and vehicle parts flowed between Ontario and Illinois. Ontario Premier Kathleen Wynne continued her lobbying efforts Monday to convince U.S. lawmakers of the importance of free trade in the auto sector as the renegotiation of NAFTA looms. Wynne met with Illinois Gov. Bruce Rauner and other business leaders in Chicago and “reaffirmed our commitment to the foundation of our economic partnership, free trade,” the premier said in a statement. Free trade between Illinois and Ontario is a priority for the automotive industry, Wynne said. “It is a key economic engine for Illinois, as it is for Ontario, and our collaboration has helped the Great Lakes Region become a world-class hub for auto production,” she said. Every month in 2016, about $233 million in vehicle and vehicle parts flowed between Ontario and Illinois, according to the Province. In 2016, Ontario imported almost $2.2 billion worth of vehicles and vehicle parts from Illinois. The meeting in Chicago came just days after Wynne and Ontario Minister of Economic Development Brad Duguid promised to “protect” the automotive sector during NAFTA talks. The two have been increasingly vocal about their concerns over signs of increasing protection in the United States, not only about Buy American policies, but also speculation of a border adjustment tax and rhetoric about the pending renegotiation of NAFTA. It's the same approach Ontario took in Canada-European Union Comprehensive Economic and Trade Agreement (CETA), she said. “Auto and agriculture are two that will always be important to Ontario in these discussions, and we just need to make sure we find the right balance while being a free-trading jurisdiction,” she said. Wynne previously met with 15 auto and labour leaders — and one government of Mexico official — on March 23 to strategize about NAFTA talks.